This article describes how to install Avi Vantage on the Cisco CSP 2100 platform. 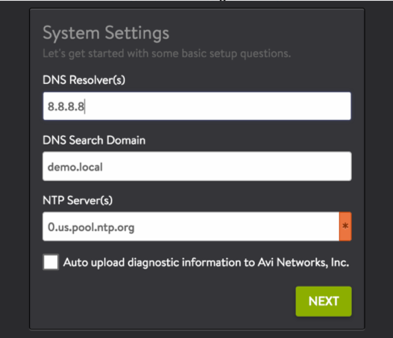 Avi Networks recommends running CSP version v2.2.5 at a minimum. The following table shows the names of physical interfaces (pNICs) on the CSP 2100, along with their supported speeds. The pNIC named enp1s0f0 can be connected to the management network. This provides access to the CSP dashboard. The 10-Gbps interfaces (enp7s0f0 and enp7s0f1) can be used as data NICs and must be connected to the corresponding data VLANs or trunk links. Note: For VLAN trunking, the maximum number of VLANs that can be added to SRIOV VF NICs created from a single PF is 64. The following table explains 3 possible NIC mapping options on CSP and the corresponding performance implications. Passthrough mode Physical NIC directly mapped to VM Physical NIC is dedicated to a VM. created from physical NIC Allows pNICs to be shared amongst VMs without sacrificing performance, since packets are switched in HW. The topology shown below consists of an Avi Controller and Avi Service Engines (SEs). To leverage the DPDK capabilities of the physical NICs, the SEs should be connected to the 10-Gbps enp7s0fx pNICs of the CSP 2100 in passthrough (PCIe) or SR-IOV mode. The SE can be connected to multiple VLANs on the pNICs’ virtual functions (VF) in SR-IOV mode. The management network can be connected to the 1-Gbps pNIC. The numad service needs to be disabled. CSP servers running versions 2.2.4 and above may have numad disabled by default, but it’s wise to check, and then take action if need be. There is more than 300 Mbytes of RAM usage. CPU utilization is greater than 50% of one core. What issue is numad causing on CSP? On CSP numad takes each candidate process (which includes VNFs) and attempts to move either the process or its memory, so that they are on the same NUMA node (i.e., a physical CPU and its directly-attached RAM). On CSP servers, it is taking between 10 and 30 seconds to try to move memory between NUMA nodes. This is because it fails to move some pages from memory. This causes the VNFs which are being processed by numad to hang for that duration. All processes (which includes VNFs) will become a candidate for numad again once the holddown timer expires. Hence, this can cause repeated instability. Note: Disabling numad is safe and has no adverse effects. Notes: To disable numad if the CSP server is running a older version than v2.2.4, contact Cisco support. Log on to the CSP dashboard using a browser. Navigate to Configuration > Repository. Click on + sign, and browse to and select the Controller qcow2 image. The Controller itself can have a day-zero YAML file before it is spun up. The YAML file needs to be imported into the repository prior to image creation. Ensure you have VNC access to the console. In a large deployment, this might require additional firewall rules. Note: In a CSP cluster, multiple copies (equal to the number of cluster hosts ) of the same image/YAML file may result. Consequently, when any deletions are required, all copies should be deleted. Typically, you would change a key (such as auth token) with the same filename and re-upload. To configure the Controller management interface statically, the IP, netmask, and gateway information must be passed as a YAML file. The name of the metadata file must be in avi_meta/*.yml format. Here avi.mgmt-ip.CONTROLLER is the management IP for Avi controller, avi.mgmt-mask.CONTROLLER is the network mask and avi.default-gw.CONTROLLER is the gateway IP address for the management network. Make sure to replace the IP address in the example with correct ones for your network. Upload this metadata file to CSP repository as shown in 3.1. This section describes how to deploy Avi Controller using both the CSP UI and the REST API. 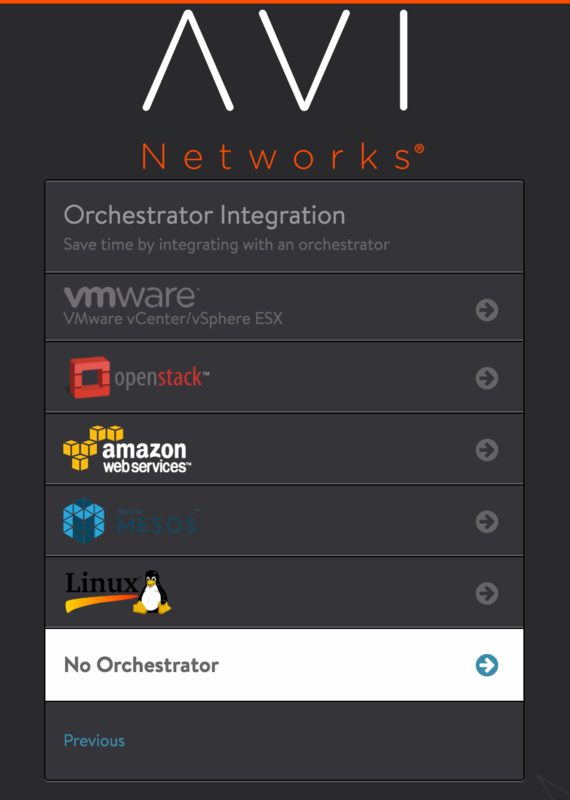 Navigate to Configuration > Services. Note: The disk size of any CSP image cannot be changed. To avoid deletion and recreation of the entire configuration, have an informed idea of deployment. Refer to System Requirements: Hardware and/or contact Avi for a recommendation. Enter “Avi Controller” in the Service Name field and press enter. Click on Target Host Name and select the host from the list. In version CSP 2.1.0, on a CSP cluster, you can select the HA host name. Leave the VNF Management IP field blank. This is set using the Day Zero Config. Click on Image Name and select the controller.qcow2 image from the list. Click on Day Zero Config dropdown and select the Controller metadata file. 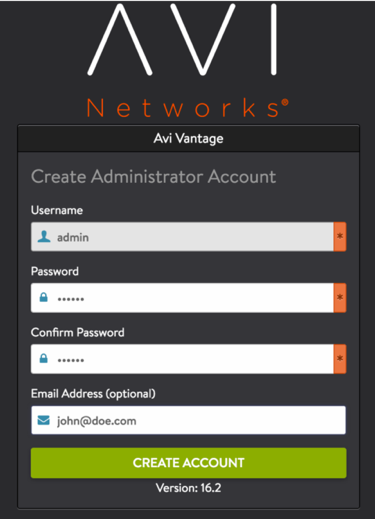 Click on + to add a vNIC and connect it to enp1s0f0 in access mode. Note: If the management network is on a different VLAN, specify the VLAN number in the VLAN field, and click on VLAN Tagged to enable tagging. (optional) Specify a password for console login using VNC. curl -X GET --user csp-username:csp-password -H "Content-Type: application/json" "https://10.128.2.16/api/running/services/service"
On the Tenant Settings wizard page, select the appropriate option. Refer to Tenants Versus SE Group Isolation. 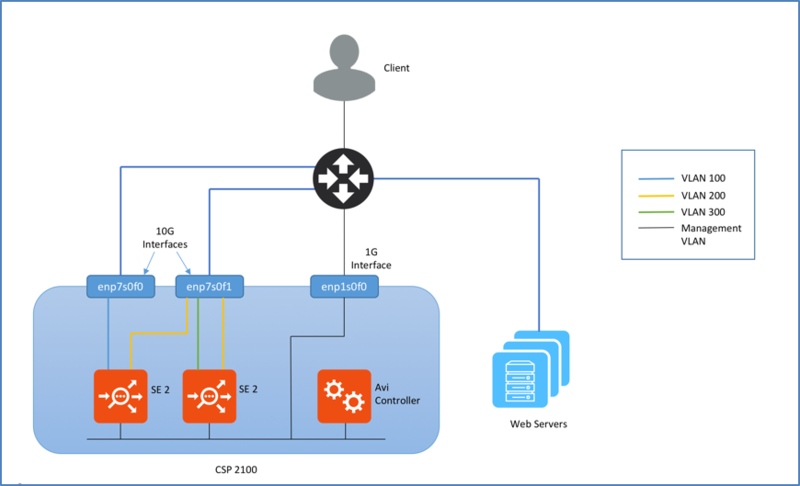 This section walks through the workflow of deploying an Avi SE on CSP, with data NICs in SR-IOV passthrough mode. Note: Not every deployment will use SR-IOV, but if it is, it must be configured on the CSPs beforehand (e.g., numVFs). A figure appearing in the Enable SR-IOV section of this article shows the number of VFs and the switch mode being set. On the Avi Controller, navigate to Infrastructure > Clouds. Click on the download icon on ‘Default Cloud’ row and select Qcow2. Upload the se.qcow2 to the CSP repository (steps to upload). To configure SE management interface statically, the IP, netmask and gateway information must be passed as a YAML file. The name of the metadata file must be in avi_meta/*.yml format. Here avi.mgmt-ip.SE is the management IP for Avi SE, avi.mgmt-mask.SE is the network mask and avi.default-gw.SE is the gateway IP address for the management network. 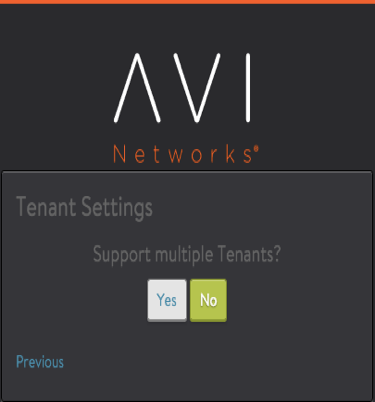 AVICNTRL is the management IP of the Avi Controller. Make sure to replace the IP address in the example with correct ones for your network. AVITENANT_UUID (optional) is the UUID of the tenant on the Avi Controller to which the SE must connect. iIf this field is omitted, the SE will connect to the admin tenant by default. Click on the key icon on the Default-Cloud row to view the authentication token key. Note: The authentication token has a validity timeout of 1 hour by default. Upload this metadata file to the CSP repository (steps to upload). Click on the settings icon for enp7s0f0. Set the “Number of VFs” to the desired number. Set the “Switch Mode” to veb. Note: In above example 8 VFs (virtual functions) are configured on the pNIC. The uer should configure this number to the appropriate number, depending on the number of services that will share the pNIC. Cisco recommends to over-allocate VFs (maximum 32 on a 10G pNIC). Repeat the above steps to configure enps0f1 for SR-IOV if required. Click on +. Refer to System Requirements: Hardware for recommendations on a minimum production SE configuration. Enter “Avi SE1” in the Service Name field and press enter. Click on Target Host Name and select the host from the list. Click on Image Name and select the se.qcow2 image from the list. Click on Day Zero Config dropdown and select the SE metadata file. Set the resource values for Disk, CPU and RAM (minimum values shown above). 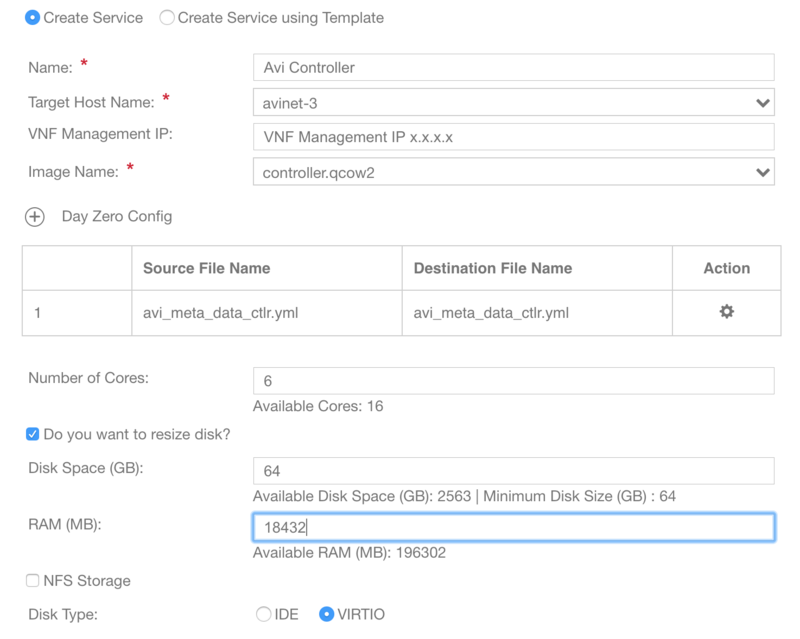 Click on + to add a vNIC and connect it to enp7s0f0 in SR-IOV mode. 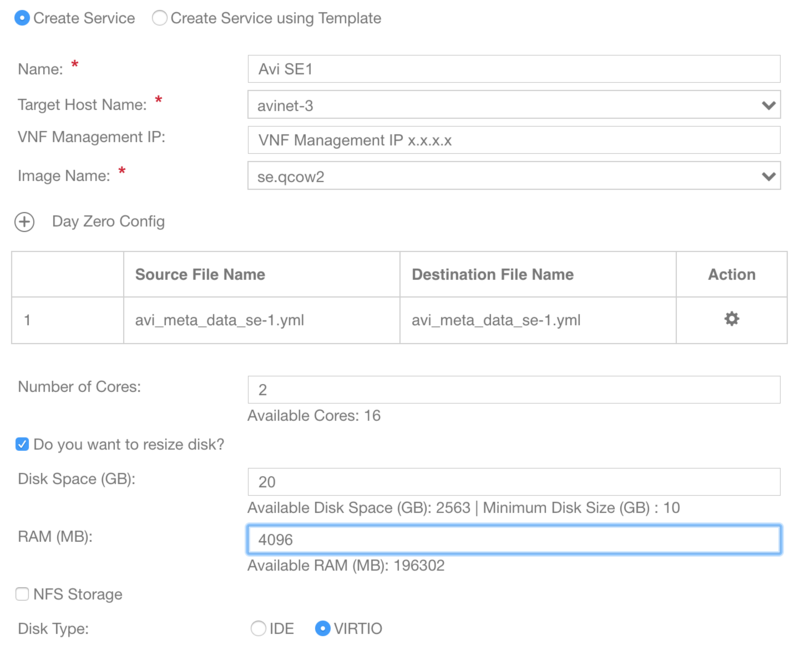 Verify the SE is able to connect to the Avi Controller by navigating to Infrastructure > Dashboard on Avi Controller UI (this may take a few minutes).